Rainwater pouring off the embankment at right created such a torrent across a 20-foot-long stretch of Highway 1 between Thirteen Turns and Dogtown Friday, that half the southbound lane dropped away. 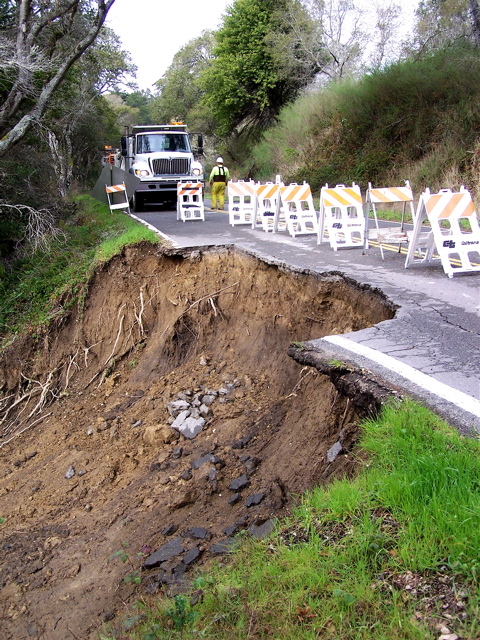 The washout occurred around 5:30 p.m. on a winding, 55-mph section of the highway. Luckily, one of the first motorists — if not the first — to come upon the break in the roadway was a Caltrans supervisor. The supervisor was “proceeding slowly” in a pickup truck, a coworker told me, and stopped when he saw water rushing across Highway 1. 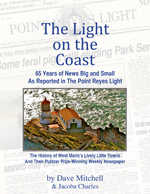 The supervisor, who was later identified as Eamonn Dymer from Caltrans’ Manzanita Maintenance Yard, then discovered that half the lane he was driving in had fallen away, and he was able to put out flares and traffic cones before any other vehicles got there. In doing so, he probably saved someone’s life because any highway-speed motorist who failed to see the gap in time would have dropped 75 to 100 feet after sailing off the roadway. By Saturday afternoon, Caltrans had erected a concrete barrier around the break, and Highway 1 was reduced to one lane in the area. Stop signs were erected at both ends of the one-lane section, and a road crew had painted “STOP” on the pavement in both directions. Elsewhere, Friday’s storm flooded low-lying areas in Muir Beach and Stinson Beach, as well as parts of Highway 1 between Stinson Beach and Bolinas, between Olema and Point Reyes Station, between Point Reyes Station and Marshall, and between Marshall and Tomales. 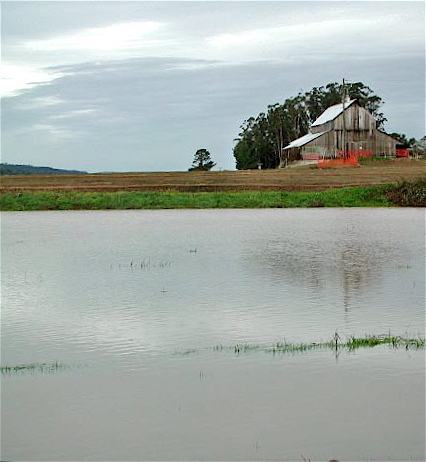 Papermill/Lagunitas Creek crested its northern levee in Point Reyes Station about 3 a.m. Saturday and flooded much of the former Giacomini Ranch, Jack Long of Point Reyes Station told me. Long, who lives on the southern levee, took this photo and the one below. 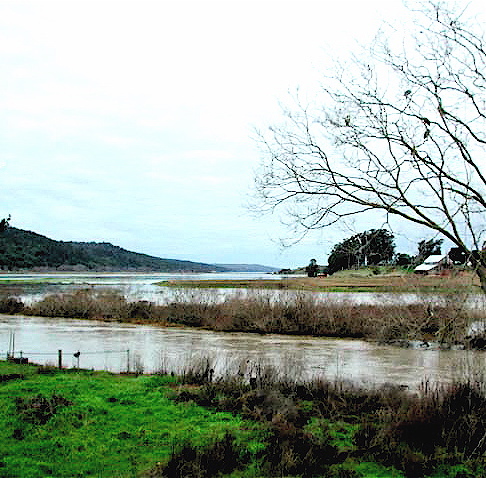 After buying the Giacomini Ranch with the intention of turning much of it into marshland, the National Park Service last year scraped away sections the northern levee. 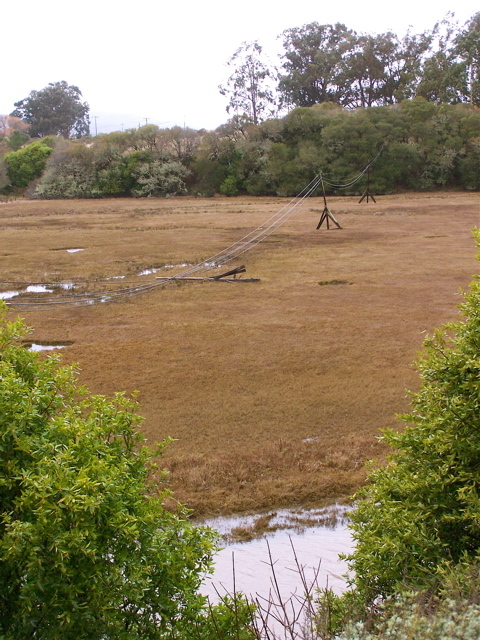 The flooded pasture of the former Giacomini Dairy Ranch, as seen from Inverness Park. Perry’s Inverness Park Store and the Busy Bee Bakery are in the foreground. Black Mountain is in the distance. Photo by Linda Sturdivant of Inverness Park. The surge of water onto the ranch from the break in the levee was not enough, however, to prevent the confluence of Papermill Creek and Olema Creek from cresting the southern levee too. Sir Francis Drake Boulevard, which is known as “the levee road” where it travels atop the southern levee, flooded Saturday and was briefly closed. 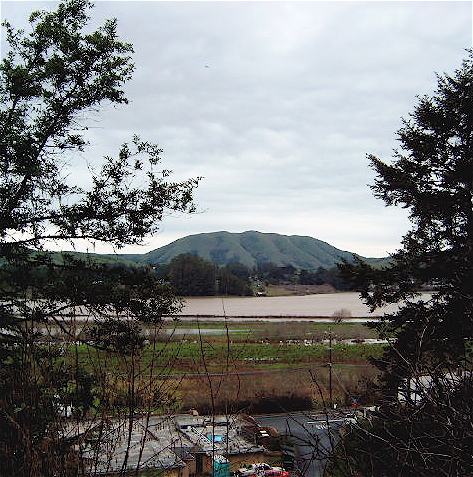 The rainstorm also blacked out much of West Marin for roughly two hours Friday evening. Bad as Friday’s storm problems were, they weren’t as severe as those that occurred during an even fiercer storm three weeks to the day earlier. Fallen utility pole in a marsh at Millerton Point. In fact, some in West Marin are still cleaning up from the earlier heavy rainstorm, which was accompanied by hurricane-force wind. Shoreline School District, it now turns out, is facing extensive repairs at Inverness School where the Jan. 4 storm sent a river of water down Forres Way and into the administration office. With water having been well over a foot deep in the office, carpeting and other fixtures must be replaced. But the real storm news is what didn’t happen: no motorists plunged to their deaths last Friday evening when a major gap opened up in Highway 1 north of Dogtown. My wife and I drove that stretch just minutes after, saw his truck, but didn’t realize what had happened until the return trip the next day. (Having stayed the night in Bolinas.) To say the least, we are grateful. Sparsely Sage and Timely is powered by	WordPress 4.9.10 and delivered to you in 0.364 seconds using 52 queries.